Heat oven to 350°F (325°F for dark pan). In ungreased 13x9-inch pan, break up cookie dough. With floured fingers, press dough evenly in pan. Bake 13 to 17 minutes or until light golden brown. Remove partially baked bars from oven. 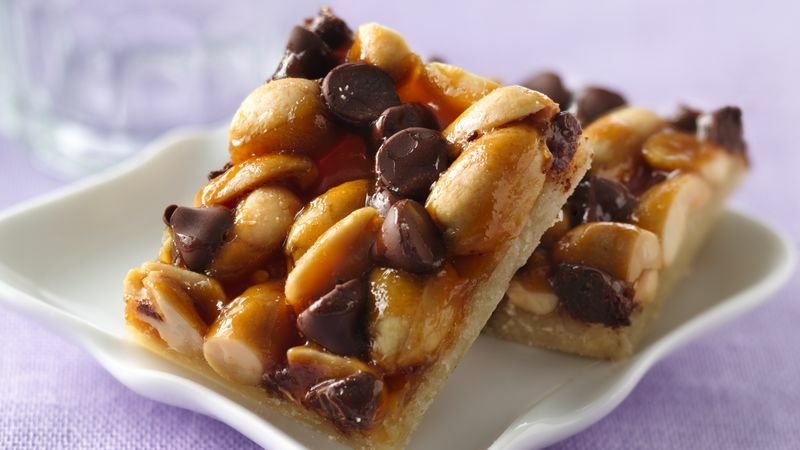 Sprinkle peanuts and chocolate chips evenly over warm bars. In small bowl, mix caramel topping and flour until well blended. Drizzle evenly over top. Return to oven; bake 15 to 18 minutes longer or until center just begins to bubble. Cool completely, about 1 hour. Cut into 6 rows by 6 rows. Store tightly covered. For easy removal and cutting, line the pan with foil, extending the foil over the sides of the pan.